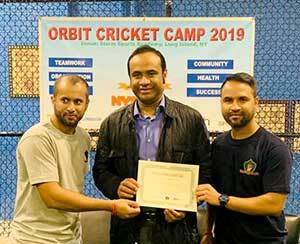 On Saturday, March 30, 2019, Orbit Cricket Club organized a unique event named Orbit Cricket Camp at Storm Sports Academy in West Hempstead, New York. 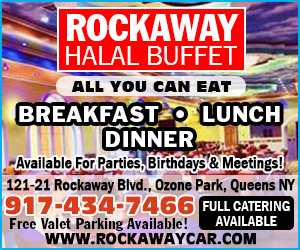 The purpose of this camp was to support the youths within the New York City Bangladeshi community to learn various skills related to cricket as well as team building, leadership and organizational development. More than 30 young cricketers from Bangladeshi community participated at this full-day event which started at 11:30 am and ended at 6:30 pm. In addition to the participants, there were many local community members and organizers were present to show their support. This event was mainly supported by NYC Development of Youth and Community Development. Arif Islam (left) and Mehraz Masud (right) makes a certificate presentation. The training day camp included sessions on improving cricket skills lead by experienced players from Orbit cricket club. It started with a brief warm up session. Then the participants were divided into several groups for different net sessions. Arif Islam—a prominent and well respected NYC Bangladeshi cricketer led the coaching in net sessions while Md Shaheen, Rifat Hussain, and Md Taher provided assistance. In between the morning and afternoon net sessions, there was a panel discussion on team-building, leadership skills, organizational development, and health and wellness. Nayeem Talukder (Jim) moderated the panel discussion. At this discussion, the panelists shared their experience and told stories of challenges and success on team building and leadership. The participants were also given a chance to ask questions and provide feedback. At the end of the day, there was a certificate and award giving ceremony in which each participant received a certificate of completion. Some of the participants shared that this event was really helpful for them as they learned so many skills on cricket and leadership. Community activist and leader Mamnunul Haq received a certificate of appreciation from Orbit because of his continued work for the community. At his brief remark, he expressed his gratitude to Orbit Cricket Club for its dedication to the community and said that this kind of event should definitely be supported. Towards the end, at his closing statement, event manager Nayeem Talukder (Jim) said, “We are committed to our community and youth development. This event is a start, and we hope to continue this every year with support from local government, leaders, and businesses.” He thanked everyone who worked really hard to make this event a success—particularly his event coordinators Saikat Talukder, Mainul Haque (Azad), Mehraz Masud, and Shahriar Jamal. Orbit Cricket Club has been one of the most prominent and successful sporting organizations within the Bangladeshi community for more than fifteen years and has been thriving each and every year. Because of its teamwork, discipline, organizational and youth leadership skills, it has established itself as successful and well-reputed organization. Orbit is dedicated to serve the Bangladeshi community. “Orbit Cricket Camp is an effort to give back to our community. We are so grateful to everyone for the support we received and we hope it will continue,” said Mahatabul Alam (Turjo)—the president of Orbit Cricket Club.